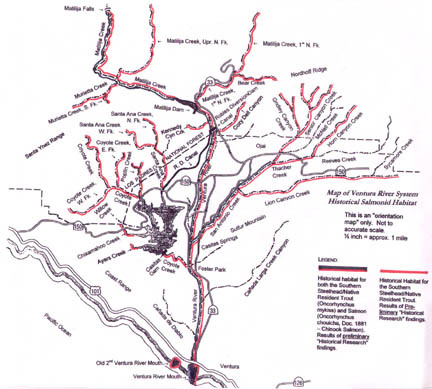 In 1948, over many objections and reservations, construction of a dam on the Ventura River was completed. It's stated purpose was water storage and flood control. Even from the conceptual stage, it was not clear that the dam would serve those ends. However, what became painfully clear soon afterward, were two environmental tragedies: disastrous decline of steelhead fisheries and starvation of beaches normally fed by sediments of the Ventura River. Now, half a century later, the capacity of the Matilija Reservoir has been reduced by over 90%, a result of the entrapment of six million cubic yards of sediment. With its crumbling concrete and silt filled reservoir, Matilija Dam no longer serves any beneficial purpose. The Ventura River sleeps behind the dam. With its removal, ocean-going fish will again be able to use the river to spawn, and the beaches will be able to feast on sediments transported down the river from the steep canyons of Matilija Creek. The time has come to undo the damage of that bad idea. It's time to take it down. 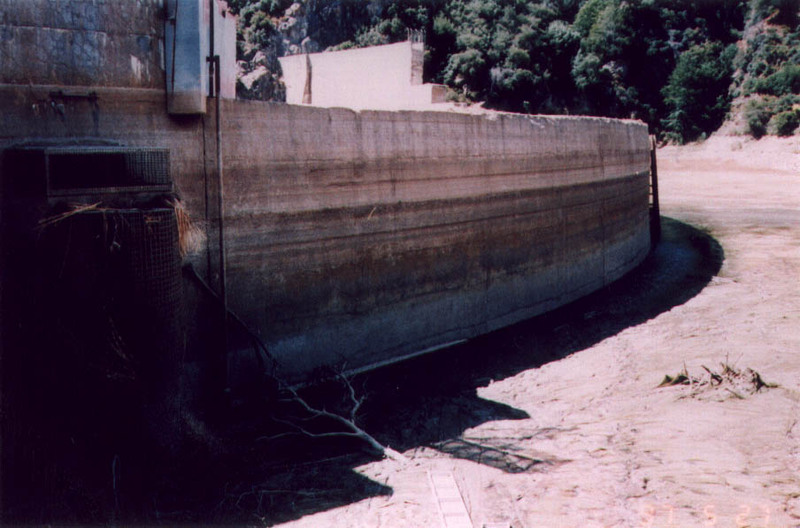 At almost 200 feet, Matilija is the largest dam ever considered for removal. There are many lessons to be learned. 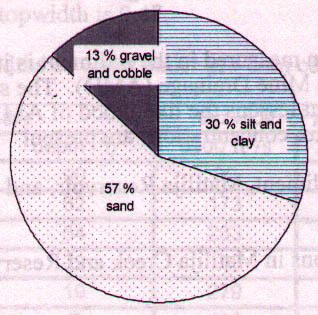 Preliminary studies have determined that although deconstructing the dam itself is fairly straightforward, the huge quantity of sediment filling the reservoir presents a much bigger challenge. If released all at once, the river downstream would suffer devastating floods. How and where to transport the sediment is the big question, and several options are being considered. Initial estimates range from $20 to $180 million. Further studies are needed to ensure that the complete removal of the dam is carried out in a safe and environmentally sound manner. There is overwhelming support for removing Matilija Dam, and a broad coalition of local, state, federal, and private agencies are working to secure the funding and congressional support needed to complete the project. Removing the dam and returning the river to its natural, free-flowing state will reopen the historic Steelhead run of the Ventura River. Habitat will be improved for the numerous species that thrived before the building of the dam. Downstream sediment transport, along with other natural processes, will occur unimpeded. The return of a viable population of Steelhead will rejuvenate a recreational fishery valued at $25 million. Renewed sediment will supply sustainable beaches in Ventura worth $50 million to the local economy for property protection and the tourism and recreation industry. The dams removal will provide increased opportunities for outdoor recreation within the restored canyon and Matilija Creek, the Ventura River, and beaches downstream. Dams kill rivers by preventing the passage of ocean-going fish, dams cut off the only known mechanism for renourishing nutrient poor coastal watersheds from the oceans. 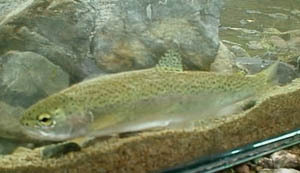 The decline of the Southern Steelhead within the Ventura River watershed indicate the decline of an ecosystem that reaches from the wilderness areas of the coast mountain range to the Pacific Ocean. Scientists have shown that salmon in the Pacific Northwest play a key role in watershed health, including the food chain of more than 137 separate species. Salmon declines, according to the research, trigger cascading declines of many of the ecosystems major food chains. In a similar manner, the Ventura River ecosystem once supported 23 species of special concern, 9 of which are endangered, 2 are threatened, and 2 are under full protection. In addition to the steelhead, these species include the California condor, California red-legged frog, Brown pelican, and the ringtail. Removal of Matilija Dam will provide fish passage to historic breeding waters in the upper watershed, and greatly enhance the opportunities for restored habitat for the other species of concern. California's steelhead restoration plan indicates that historically the Ventura River probably had one of the largest runs of steelhead in southern California-and that restoring the Ventura runs will be critical for steelhead recovery in the region. Scientists consider the southern steelhead a genetically distinct fish species, the parent of all steelhead on the Pacific Coast. 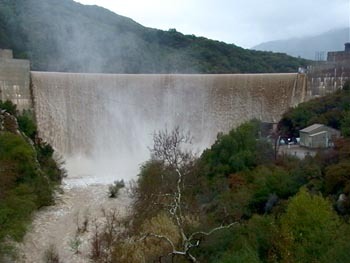 On the morning of March 6, after 48 hours of rainfall, flows of over 6,000 cubic feet per second rushing through the "notch" in Matilija Dam created a torrent of water 358 feet wide and 165 feet high. 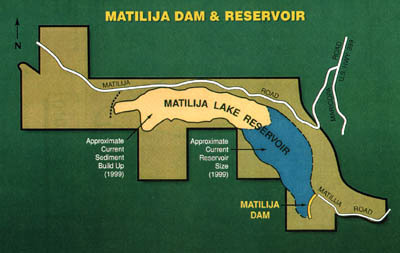 Although Matilija Dam was constructed primarily to supply water for a rapidly growing Ventura County, it was also proposed to control floods. The "5 year" storm pictured above was minor compared with the 100-year deluge that occurred in 1969. 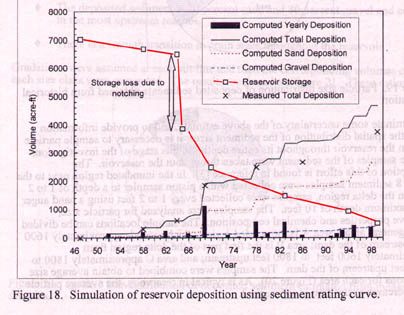 That short duration event dumped 27% of the sediment that rests behind the dam today. It also rendered the 17-year-old reservoir useless for flood control … and it has been ever since. 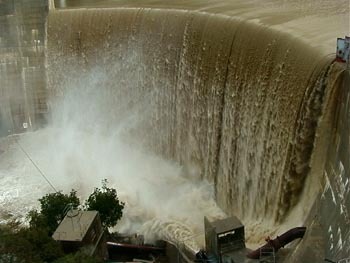 The release valve at Matilija Dam can discharge a maximum of 250 cfs (cubic feet per second). The release pipe is visible at the bottom of this image - 250 cfs looks pretty small against that backdrop! The graph below shows the history of the flood - a total of 12.65 inches of rain fell in Matilija Canyon. The red line represents the flow of water over the dam spillway, peaking at 6890 cfs (cubic feet per second) on the morning of March 6. The river flow downstream at Foster Park peaked around the same time at just under 20,000 cfs.